2018 Kawasaki Ninja 300 ABS launched at a ‘lucrative’ price of Rs 2.98 lakh. What you get for that price! Kawasaki India recently launched the 2018 Kawasaki Ninja 300 ABS in India. The bike comes in two color options. Kawasaki brings the Ninja 300 to India via the CKD (Completely Knocked Down) route. That is the reason for its price-drop. So, the new model will be cheaper by a whopping Rs. 62,000 than the CBU unit. The bike will compete with the KTM Duke 390 in the same price bracket. Furthermore, the 2018 Kawasaki Ninja 300 ABS wears new body graphics and color options. Besides, it also gets ABS which is an essential safety mechanism while riding a motorcycle. The new Ninja 300 mostly uses the locally sourced components. This affected in the decrease in the price of 2018 version by Rs. 62,000 than the departing model. Thus, with the new price, the Kawasaki Ninja 300 ABS becomes the most affordable 300cc twin-cylinder bike in India. 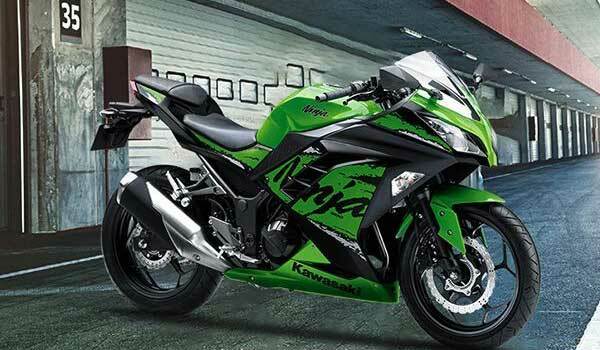 Kawasaki will continue to import the engine and chassis of Ninja 300 from Thailand. However, it localized the parts such as the body panels, wheels, and tires. Kawasaki replaced the Thai-made IRC tyres with MRF Zappers. The Kawasaki Ninja 300 gets the power from the 296cc, liquid-cooled, parallel twin-cylinder, DOHC engine with 8-valves like other Ninja series models. The engine churns out the power and torque output of 38bhp and 27Nm respectively. The motorcycle comes with a 6-speed gearbox with the assistance of a slipper clutch. The 2018 Kawasaki Ninja 300 has 37mm telescopic forks at the front and mono-shock suspension at the rear. A 290mm petal disc with dual-piston calipers at the front and 220mm petal disc at the rear are responsible for the braking duties. 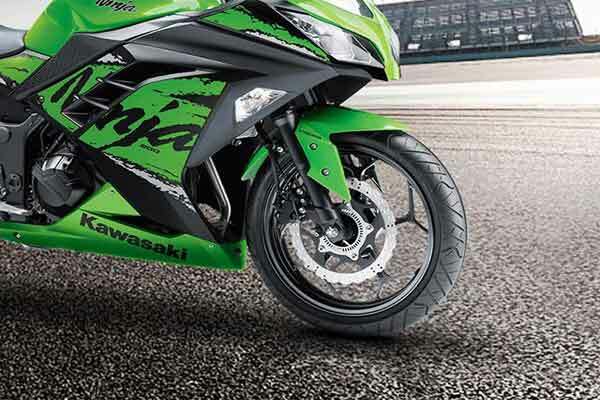 The Kawasaki Ninja 300 offers the Endurance brakes with Dual-channel ABS (Anti-Lock Braking System) as the standard for added safety and control. The 2018 new Ninja 300 ABS is available in two color options wiz: lime-green/ebony and candy plasma blue. Additionally, the Ninja 300 offers features such as the branding on the fairing, dual headlamp setup and sharp front-end with a windscreen to reduce the wind-resistance. Kawasaki has lowered the ride height of the bike by 5mm while the curb weight of the Ninja 300 has increased by 7kg to 179kg. However, other mechanical components remain unchanged. Besides, the 2018 Kawasaki Ninja 300 challenges the likes of KTM RC 390, Yamaha R3 and the Benelli 302R.